What great news about the crepe myrtle…what a cute turtle garden friend! I like the box turtle. 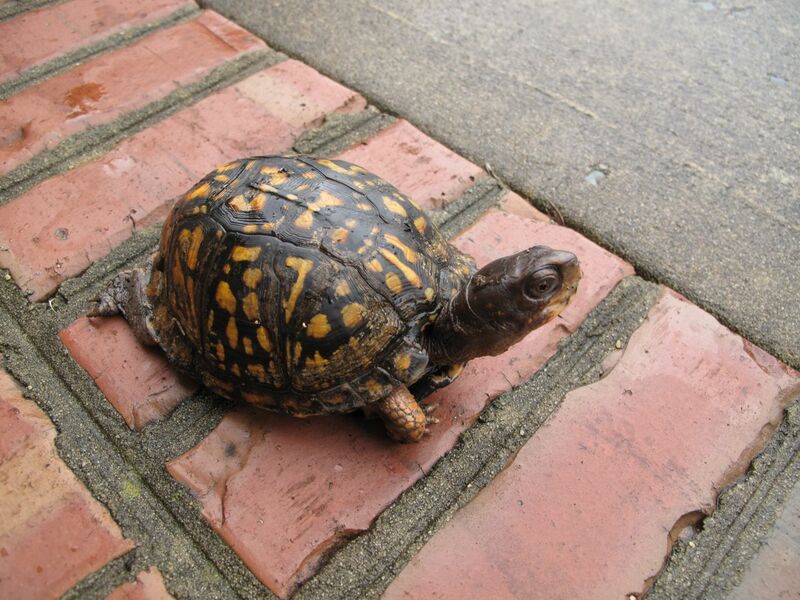 When I was a kid I had a box turtle as a pet but I built him an outdoor cage with inadequate security. He escaped. I also have a crape myrtle. Mine doesn’t flower until mid to late August. Wait and see is often the best gardening policy. Are they common where you live Christina? It will be nice to look forward to the tree blooming in August. Around town I started noticing them in early June. The larger of my pair of Crape Myrtles (the one that didn’t get knocked over in a storm) is a little behind the little one in blooming. Glad they’re resilient trees. Lucky girl, we should really have a good soaking soon as we’ve planted up new parts of the garden recently. 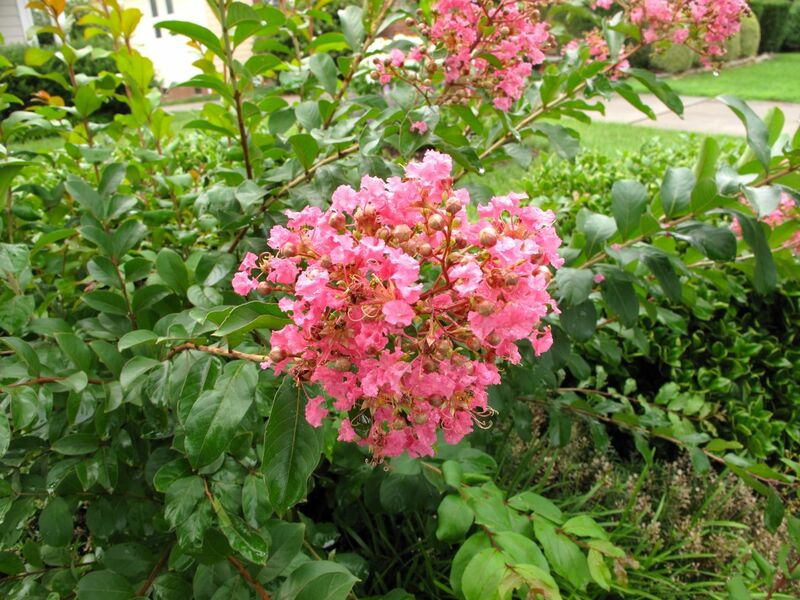 Judicious pruning should get your crape myrtle back in shape! Turtles are loving the wet weather, but butterflies…not so much. I think that you can prune and rebloom the crepe myrtle this time of year. Their bloom is triggered by heat I think. That’s good to know John. Thanks for the tip. I was afraid to do anything to it until next February. It’s good that your little tree has survived even though it is now a bush, a bit of pruning will sort that out I think. The flowers on your tree are beautiful and your neighbourhood must look fantastic at the moment if they are all flowering at once. Thanks Pauline. Hope the crape myrtle can survive my pruning skills too! They are such beautiful trees. Lagestroemias are such tough plants, capable of bearing hard pruning and drought. I have a couple, although they are still rather young. I’m glad it has recovered enough to flower. It’s a very pretty shrub which I haven’t seen in our region. Thanks! Crape myrtles can get very tall. Ours are a dwarf variety. They’re blooming all over the South US now. I have two crape myrtles in my CT garden (zone 6). Some winters one, or both, die back to the roots but they always grow back stronger than ever. I have very sporadic flowers, if any, so I’m really hoping that one of these years I’ll have a tree full of flowers like yours! 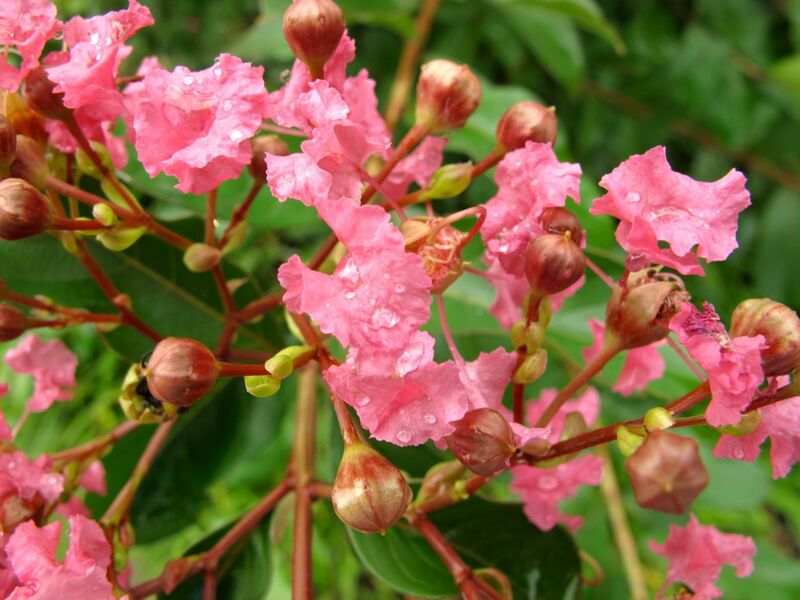 Debbie, that is so interesting to know about crape myrtles being able to live after dying back in the winter. Then I will assume my little brave one is going to pull through. Hope you get some nice blossoms this year! What a handsome turtle. When I was growing up, we had a couple of turtles that moved into the ponds we dug to store rain water. Once in a while they would walk back and forth between front and back ponds. The dogs would bark at them and the turtles would ignore them in return. I’ve never figured out why they went back and forth, but it is a fond memory. Did you try to convince him to stay in your garden? I’m not a great gardener but it always amazes me how cutting back roses hard improves them so much the following year. I agree but some plants respond to that tough approach.